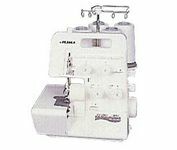 2-Needle, 2/3/4 thread overlock with differential feed. ♦Max. sewing speed - 1500 rpm . ♦ Max. stitch length - 4 mm. ♦ Needle gauge - 2 mm. ♦ Overlocking width 4 or 6 mm. 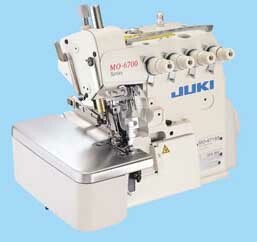 High-speed, overlock /safety stitch machine. Number of threads - 3/4/5. Differential bottom feed. APPLICABLE: For various kinds of sewing materials and processes. For light-, medium- or heavy-weight materials. ♦Max. sewing speed - 7000 rpm . ♦ Overlocking width 1,6 - 6,4 mm. 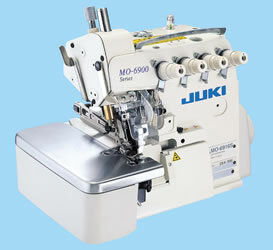 Super-high-speed, overlock / safety stitch machine. Number of threads - 3/4/5. Differential bottom feed. APPLICABLE: For a wider range of materials and processes to finish high-quality soft-feeling seams. For light-, medium- or heavy-weight materials. ♦Max. sewing speed - 8500 rpm . MO-6904G - for extra heavy-weight materials. MO-6904J - variable top-feed for extra heavy-weight materials. MO-6904R - variable top-feed, for light- to heavy-weight materials.